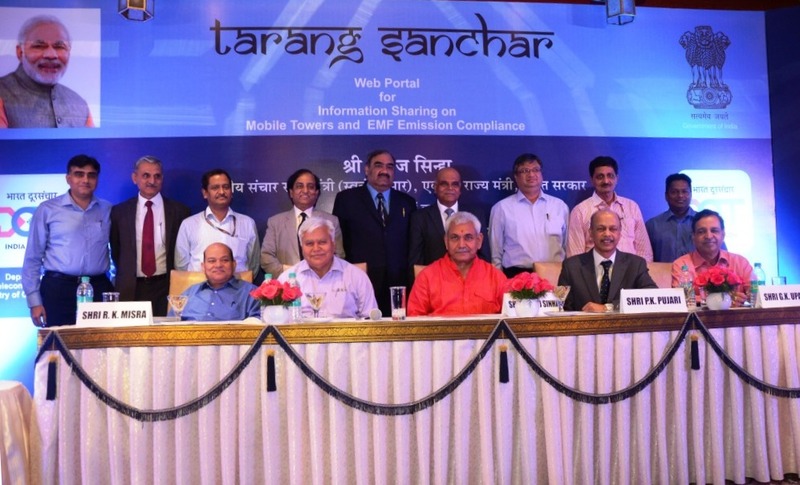 New Delhi, May 02, 2017: Department of Telecom (DoT), Ministry of Communications today launched Tarang Sanchar, a web portal for Information sharing on Mobile Towers and EMF Emission Compliances. Shri Manoj Sinha, Hon’ble Minister of State (Independent Charge) for Communications and Minister of State for Railways, formally launched the Tarang Sanchar portal in an event organized at New Delhi. While delivering his inaugural address, Shri Manoj Sinha said that the launch of Tarang Sanchar Portal will definitely help in clearing myths and misconception of public on mobile towers and emissions from them. He expressed that the portal empowers any common person to know, at the convenience of a mouse click, about towers working in a particular locality and whether they are compliant to the EMF emission norms defined by the Government. Secretary, Department of Telecommunications, Shri P.K. Pujari who is also Secretary, Ministry of Power, during his keynote address said that the Government is fully committed to protect the health of its citizens. To ensure the same, DoT has prescribed standards for Electromagnetic emissions from mobile towers that are ten times stricter than the international standards prescribed by International Commission on Non-Ionizing Radiation Protection (ICNIRP) and recommended by World Health Organization (WHO). Indian Government has taken adequate steps to ensure that Telecommunications Service Providers (TSPs) strictly adhere to these prescribed norms. Though there is no scientific evidence of any health concerns from low power mobile BTSs, a need was felt to educate the citizens about EMF emissions from mobile towers and status of their compliances. In its endeavour to clear misconceptions around the issue of mobile tower emissions, DoT has launched Tarang Sanchar Portal. The portal will generate confidence among the public about effectiveness of the EMF compliance process in India. Shri G K Upadhyaya, Member (Technology), Shri R K Misra Member (Services) and Smt Anuradha Mitra, Member (Finance) in Telecom Commission also graced the occasion. The features of the Tarang Sanchar Portal were demonstrated during the launch event. The EMF Portal is designed to provide a public interface where an easy map-based search feature has been provided for viewing the mobile towers in vicinity of any locality. By click of a button, information on EMF compliance status of mobile towers can be accessed. Detailed information about any tower site, if requested, will be sent on email to the users. Additionally, any person can request for EMF emission measurement at a location by paying a nominal fee of Rs 4000/- online. The tests will be conducted by the local Telecom Enforcement Resource and Monitoring (TERM) filed unit of DoT and the test report will be provided to the requestor. The portal also has ‘EMF Overview’ and ‘Learn’ Sections, which provide numerous articles, booklets and videos, to further educate the citizens about EMF and coverage of telecom services. Public can also access the ‘DoT Initiatives’ section which has information on various leaflets, articles and Frequently Asked Questions. In addition to Government to Citizen (G2C) services, portal also facilitates Government to Business (G2B) service delivery in a transparent and eco-friendly manner. The Portal enables a method of maintenance and retention of end-to-end records including submission of compliance by Telecom Service Providers and paperless processing by TERM cells. Tarang Sanchar portal is a unique initiative as it is one of the largest and most complex inter operator database of its kind in the world. It has the complete collated technical details of over 14.5 lakh base stations (BTSs) spread across the country of all technologies (2G, 3G, 4G etc.) and of all Telecom Service Providers (TSPs). The Department of Telecommunications, abbreviated to DoT, is part of the Ministry of Communications of the executive branch of the Government of India. Its mission is to develop a robust and secure state-of-the-art telecommunication network providing seamless coverage with special focus on rural and remote areas for bridging the digital divide and thereby facilitate socio- economic development; create an inclusive knowledge society through proliferation of affordable and high quality broadband services across the nation; reposition the mobile device as an instrument of socio-economic empowerment of citizens; make India a global hub for telecom equipment manufacturing; promote development of new standards to meet national requirements; attract investment, both domestic and foreign and promote creation of jobs.